Hello everyone! Today we are celebrating the newest Simon Says Stamp DieCember® collection and I'm really happy to have you here! ¡Hola a todos! Hoy estamos celebrando el lanzamiento de la colección DieCember® 2017 de Simon Says Stamp y ¡estoy encantada de teneros por aquí! There are so many beautiful dies in this collection it was difficult to choose what to use first. The best thing about them is that you don't need to add much more to create a great card! Hay tantos troqueles chulísimos en esta colección que ha sido difícil decidir cuál usar primero. Lo mejor es que los troqueles hacen casi todo el trabajo por ti y no necesitas añadir mucho para tener una tarjeta preciosa :). To make these cards I used Distress Oxide Inks on the background and the dies Moon and Star Border, Swirling Star Trail and Far Away Forest Collage. You can watch how I made them in the video below or at my Youtube channel. Para hacer estas tarjetas he usado tintas Distress Oxide para el fondo y los troqueles "Moon and Star Border", "Swirling Star Trail" and "Far Away Forest Collage". Podéis ver cómo las he hecho en el vídeo de aquí abajo o en mi canal de Youtube. Si queréis más inspiración con cositas de las nueva colección, podéis ver mi entrada anterior aquí. As I mentioned before, this post is part of a fun blog hop and of course that means there are prizes! Simon is giving away a $25 coupon to every stop on the hop. Just leave a comment below for a chance to win and check Simon's blog next Wednesday to know if you are one of the lucky winners! And now it's time to start hoping! The next stop is Jessica Frost-Ballas! 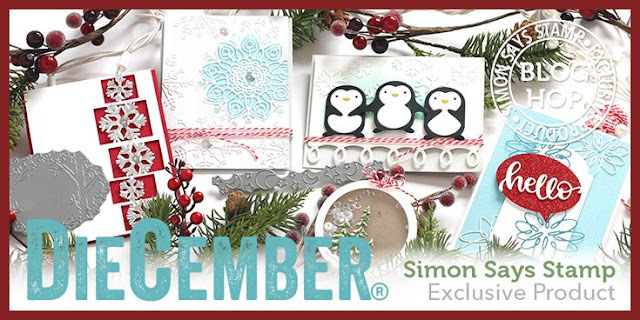 You can also start at the Simon Says Stamp blog. And don't forget to check tomorrow's hop for more amazing inspiration! Como he dicho antes, esta entrada es parte de un "blog hop" y, por supuesto, ¡hay premios! Simon sortea una tarjeta regalo de 25$ en cada parada del hop. Solo tenéis que dejar un comentario en esta entrada para participar. Los ganadores se anunciarán el miércoles que viene en el blog de Simon Says Stamp. Y ahora ¡a saltar! La próxima parada es Jessica Frost-Ballas. También podéis empezar en el blog de Simon Says Stamp. ¡Ah! Y no olvidéis que mañana hay otro blog hop cargado de inspiración :). Gorgeous clean & simple cards! beautiful yet simple cards ! Love these cards! I'm going to try this with dies I already have, but am also adding the 3 you used to my wishlist. Such beautiful cards! I especially love the sending hugs and prayers card. You made faraway forest and the oxide inks look like they were made for each other. Beautiful! The forest die is great for framing sentiments! Love that blue cut out card and think it would also make a beautiful welcome for a new baby boy card! Both cards are very beautiful! Thanks! such pretty cards, and so simple, too. the new dies are really gorgeous. What lovely cards! I struggle with sending cheerful holiday cards to friends who are going through difficult times. Your cards are a beautiful solution. These are so darling. I like that you showcased the versatility in this release. I live your distress oxide backgrounds! Love your cards and the colors you used. Very clean and simple but beautiful. Loving this release Amanda and how you used these dies. All of your cards were great ( even the first 2)! Your colours of Oxides you used are so pretty for the backgrounds. We'll done as always. I love these cards and your video makes me want to make both of them! I am definitely going to give the Bristol paper a try, because blending with Distress ink is a real chore for me. Thank you so much for sharing your creativity! hmmm. I also like both sets. the second is my favorite. great backgrounds!! Love the moon and star dies! That and the colour scheme inspires me to create something with a dreamy theme. great cards. I love the distress oxide backgrounds behind the dies. Lovely cards! The far away forest die looks great with the gradiated background. Such beautiful cards. Love how you used the distress oxide backgrounds with the dies. I love the hang in there card but both are beautiful. Loved how you showed that you changed your mind on the card design. I love the sending prayers cards it is so pretty. The hang in the card is pretty too. Such beautiful cards. I love the Distress Oxide coloring. This release is wonderful. Beautiful clean and simple cards using the oxide inks. Beautiful cards - I love the lovely inking you did - makes the white panels and die cuts pop. The moon/stars card looks especially beautiful to me - gorgeous colours. Gorgeous cards... the dies from SSS are amazing. Oh my I love all of your cards, so beautiful!! Love the white with the bright color pops!!! Beautiful cards!! Gorgeous cards! I'm in love with these dies! That glitter paper and those snowflakes were made to go together! Loving this SSS blog hop this morning! Great way to start my weekend! beautiful card. love the new dies. I was eyeing the swirling star trail....now I know I need that one! Super cute! Beautiful cards! I love the inspiration all you ladies give. Beautiful cards. I especially like the tree frame. Oh Amanda I LOVE these! CAS is right up my alley and you've shown beautiful cards you can make with a little inking & die cutting...they are outstanding!! I love to watch your videos. Thanks for your card tutorial. The moon and stars is great. Beautiful cards. Love the simplicity of them. Those are beautiful! I love the Distress Ink backgrounds and the moon and stars cards are both gorgeous. Gorgeous cards, and I love the pretty distress backgrounds. Very beautiful cards. Soft and pretty. Enjoyed watching your video for your cards as always Amanda. The cards are amazing! Thank you for the video and tips. Wow I just love your cards. So pretty. I especially love the moon and stars die. Such bright & cheery cards! Very pretty cards. Both versions! I love the dies, especially the swirl. These are really pretty CAS designs! I love the tiny cut-outs, little moons, stars, and the trees all look gorgeous! Both are stunning cards and it's refreshing to see non-Christmas cards with these dies. Your cards are so fun , especially the 2 stars and moons cards I personally like the first one best. thanks for sharing. Thanks for the inspiration! I enjoyed your video, and I'm definitely going to try your paper recommendation. I love the swirling star trail die, but am also now thinking of uses for the far away forest collage. Beautiful new dies and cards! I especially love the snowflake. Beautiful cards. Proof that clean and simple does not have to mean boring. I now have 3 more SSS dies that I must have. Ambos diseños son hermoso. Felicitaciones por tanta habilidad. Beautifully blended backgrounds to go with those amazing Dies. Very beautiful cards. Love your colorful backgrounds. Your cards are beautiful! So many fantastic dies in this release! What beautiful cards. Love the serene scenes. And another great release from SSS. Such beautiful cards! This Die-Cember release is fantastic! Love how simple and pretty these cards are! Beautiful cards, Amanda; I love how you created simple designs that allow the die to really stand out. I LOVE the Faraway Forest with your gorgeous background! and that beautiful snowflake!! I went back and bookmarked the page... thanks for the fab inspiration! So many interesting dies in this release. Hard to pick a favorite. The Oxide Ink backgrounds are a great way to show off the new dies. Beautiful projects! Beautiful cards! I especially like the moon and stars and your use of the Distressed Oxides on your cards. wonderful cards, Amanda - especially love the "hang in there" card and the colors you used. I love beautiful and simply designed cards. Your cards a amazing. So pretty. Thanks for the inspiration. really gorgeous! Love the colors your chose! Love the intricate dies! Your cut away window with the trees is very pretty! What beautiful cards!! I really like what you did with the frame die with the inking and putting the sentiment in the middle. Gorgeous!! Love the cards especially the forest one. Would make a lovely baby card. So many pretty elements in both cards! Love them both. I love the cards with more white space! Thanks so much for being real with us and showing us that it is ok to change it up! Lovely cards! I love the simple beauty of the stars and moon card-- and the color is just fantastic. Love the stars and the moon. What gorgeous cards, I love that "peeking through a window" effect! The "Hang In There" card is beautiful! The colors remind me of a sunset! These are gorgeous! What a beautiful way to use these dies. Beautiful cards. Hard to pick a favorite die but would have to say Felicity snowflake....or maybe the collage dies...just want them all! Lovely cards with nice background. Cute cards. I love that tree die. This is gorgeous and I love the background colors. Classy and beautiful. Beautiful cards! I really like the one with trees. Very cool coloring! Las tarjetas son preciosas! Me encanta lo dulces que te han quedado! Y los troqueles son genialea!!! I like the use of the swirling star trail with the moon and star border. Love your prayers and hugs card!! Perfect for giving some love! Love the cards, though the hugs and prayers card is my favorite. So pretty! Love the ink blending. I love the oxide background with the dies on top. The moon's and stars are my favorite. Both cards are wonderful! Your oxide background really showcase the dies. Beautiful cards Amanda, great releases from SSS! Now these are just fabulous! I love the clean and simple look to them but they sure have a WOW factor! Stunning! Love your forest collage die scene! Great use of some very cute dies! Great inkblending and lovely cards, the first ones that you made included. I loved them all! Me encantan tus tutoriales!!! Ojalá tenga Suerte y me toque el sorteo 🤞🤞 gracias! I like the Distress Oxides colors peeking through the die holes. The distress oxides make the cards *POP*! Beautiful work! Your prayer and hug card is just perfect for some of my friends who are sad this Christmas. I've been afraid to use my Distress Oxide Inks. I saw so many great technique tips in your video that I think I'm ready! Love the card!! You created very clean and beautiful cards. Both cards are very nice. I like the simplified ones at the end best but the others were nice as well. Beautiful cards and love the coloring with the oxides. one on the wish list. Beautiful cards! Love the colours! Watched the video on youtube! Love it! Loved both versions of both cards! White space kind of scares me, so I had the opposite impression! Both beautiful, though! Wow!Beautiful cards! Love the one with the tree dies. Gorgeous colors! I love your snowflake ornaments. I'm going to borrow the idea for gift tags. Great cards, love our ink blending. Love the forest collage die. Beautiful cards! Your distress oxide backgrounds are gorgeous, especially with the dies that you used! I am adding them to my Christmas Wish List right now! I like the changes you made at the end. I also use Bristol paper. It truly does make blending a dream!! So very pretty. Thanks for the inspiration. Beautiful cards! You made the backgrounds look so easy to do that I'll have to try again; maybe I'll have more success with them. Wonderful video. Your card ideas are beautiful. I love the swirling star die. Often times, simple is so very nice. My favorite is the forest scene with the wonderful background. Both cards were great but I really loved the Hang in There, both the way you did it and the die itself. I agree, I prefer the simpler second one both are special. And your background blending is gorgeous; they looked like skies, both of them. Beautiful projects! Thank you for sharing them! Simply beautiful thank you for sharing. Your two, no four cards are beautiful. I agree with you, the Forest card is better with a bigger white frame, but for me the Stars card is really great in both versions. Thank you for sharing. With these wonderful dies, clean and simple was the way to go. Love your Distress Ink backgrounds, too. Thanks for sharing your beautiful designs. Beautiful cards, love the dies you used and your Oxide backgrounds. lovely cards. We all need encouragement and these cards are wonderful. Awesome dies. Really enjoyed your video. I loved both versions of the moon and stars card. Beautiful cards! I love the techniques you used! These cards are wonderful! Thank you for your video showing how you made them and how you changed your mind. Fun to see your process!! Beautiful background color combos on both of your lovely cards! I liked both of your cards the first time and I probably would have been happy but the revised cards are much better. Your cards are really beautiful...I love the simplicity! The backgrounds are so pretty. Thanks for making the video, too. I love watching how the cards are made! A beautiful way to frame those dies - I particularly love the frame it provides for the sentiment! I NEED one of those! I like your encouraging cards. Your cards are Fabulous!!! I love all these dies!!! Beautiful cards! Great release. I just love snowflakes. Son preciosas! Me encantan! Bss. Thank you for the inspiration and wonderful video! I think you made the perfect choice with the simpler cards. They are both just beautiful. What beautiful cards! I especially love the one with the moon and stars! Stunning! I can't select a favorite. Soft and dreamy! What lovely, simple cards. Beautiful cards - both are lovely. Looks like a good wintry release - can't wait to play! Oh, I just love your style! Thank you for the ideas & inspiration. I really like the Far Away Forest die. Beautiful cards, I especially love the lovely tree oval window card! Great cards! Love the colors in them. Thanks for showing how you did them. Have a great week! Love the simplicity of the cards, I have the oxide inks, I just haven't used them yet. I'm tempted to crack them out and see what I can create now. Thanks for some awesome ideas. These cards are so beautiful. Thanks for sharing. Oh Beautiful cards.. the dies are beautiful and so is your blending! Love the simple and colorful designs of your cards!